Senior citizens often require care from a team of care professionals that may include doctors, family caregivers and in-home care providers. However, when an issue arises it can be difficult for seniors to recall exactly which doctor they saw regarding what condition – and what the outcome was! For other caregivers and family members, this can be concerning, especially when vital health information needs to be shared with multiple facets of a care team. While paper record sharing was standard practice for decades, this method is time consuming when it comes to vital information sharing. With a wealth of new technology, such as home care software, home care systems and electronic medical records, some seniors and their loved ones are finding it easier to keep track of medical records and care histories. 1. Medicare BlueButton: For seniors needing to track their medical records, Medicare provides the “BlueButton” program that allows seniors to electronically download their medical records that can be securely stored and shared with family members and caregivers. This is a way for seniors and their loved ones to keep all of a senior’s medical records securely stored at home. You can find more information on Medicare’s Blue Button here. 2. 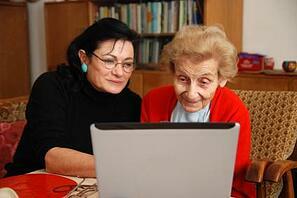 Home Care Software & Home Care Systems: Not all of a senior’s care is medically based. Many seniors are also receiving in home care from a private duty agency. However, information on care plans and in-home care schedules can be just as important as medical records. Fortunately, with home care systems like ClearCare Online available through the best home care agencies, seniors and their loved ones can also get electronic access to home care records via an agency’s home care software. One unique feature offered from many agency’s using ClearCare Online’s home care software is remote access for family members and seniors within the home care systems. After logging in, users can see care logs, tasks completed for seniors, invoices and even messages from caregivers. To enhance communication among a care team, agencies and family members can also choose to provide log-ins to the home care software to geriatric care managers, doctors and other pertinent care professionals. With technology like home care systems and electronic medical records via Medicare becoming more accessible to seniors and their families, elderly individuals are gaining more control over their health information – and using it to improve wellbeing. Leave us a comment and let us know how a technology like home care software from ClearCare Online has improved or changed your caregiving experience.